Uranus is the planet with the coldest atmosphere in the Solar System; temperatures can drop down to -224 °C at a pressure level of 0.1 bar. As seen from far away Uranus is quite a featureless planet, but don't be fooled by the calm impression. Uranus hosts strong winds with wind speeds of up to 900 km/h (560 mph), much higher than the wind speeds inside Jupiter's Great Red Spot (up to 680 km/h at the edges of the hurricane). Considering the wind chill factor, these conditions would feel much colder than absolute zero (0 K or -273 °C)! Uranus has a ring system which is much less prominent than the one of Saturn. Indeed in most images you'll not be able to see it. In one sense Uranus is unique in our Solar System; its axis of rotation is tilted sideways. This means that where the other planets have their equators, Uranus has its poles. 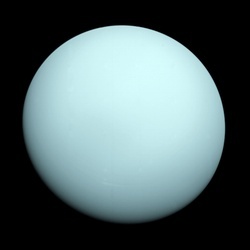 Since one orbit of Uranus around the Sun takes about 84 Earth years, each pole has a "day" of 42 consecutive years before Uranus dusk falls across the pole and you can say goodbye to the Sun for another 42 years. The reason for this tilt is not yet fully understood, but it is supposed that an Earth-sized protoplanet collided with Uranus during the formation of the Solar System, causing its axis of rotation to tip.